Bridge. There are meadows and hills for all of our special friends so they can run and play together. There is plenty of food, water and sunshine, and our friends are warm and comfortable. times gone by. The animals are happy and content, except for one small thing; they each miss someone very special to them, who had to be left behind. group, flying over the green grass, his legs carrying him faster and faster. from your life but never absent from your heart. 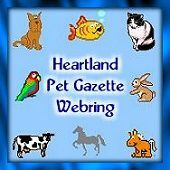 Want to join the Pet Gazette Webring? Information contained in this homepage is given as supplied and in good faith. No responsibility is taken for any losses or misgivings which may arise from the use of any supplied information. We welcome emails bringing to our attention any inaccuracies or suggestions for improvement.No liability will be accepted by the owner of this site. We take care in compiling details, but cannot accept responsibility for any errors.